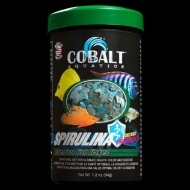 Cobalt Mysis Spirulina flake fish food is a highly palatable Mysis shrimp and Spirulina algae based formula for all tropical and marine herbivores and omnivores. 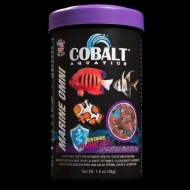 Cobalt Marine Vegi flake is a complete formula for all marine herbivorous fish. 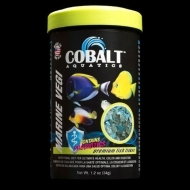 Cobalt Marine Omni flake is a powerful blend for all marine fish. Highly palatable formula helps finicky marine fish to eat prepared foods. 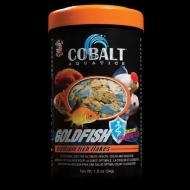 Formulated for specific diet requirements of all goldfish. Nutritionally balanced for beautiful color, consistent growth and palatability.. Enhanced with Probiotics and Cobalt Blue Flake’s triple vitamin dose and immunostimulants. Will not cloud water. 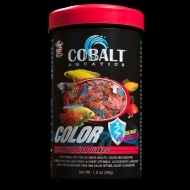 Color enhancing formula for all tropical fish. Nutritionally balanced for consistent growth,palatability, with added ingredients to promote stunning color. Enhanced with Probiotics and Cobalt Blue Flake’s triple vitamin dose and immunostimulants. Will not cloud water. 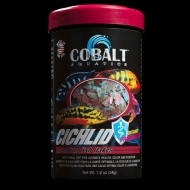 Formulated for specific diet requirements of cichlids. Nutritionally balanced for consistent growth, palatability and beautiful color. Enhanced with Probiotics and Cobalt Blue Flake’s triple vitamin dose and immunostimulants. Will not cloud water. 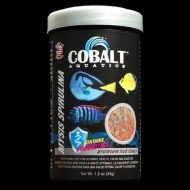 Coralife AquaTongs give you that extra extension when trying ot access hard-to-reach areas in your salt or freshwater aquarium. No aquarium is complete without lighting. Marineland Single Bright Strip Lights offer a simple solution to your aquarium lighting needs. 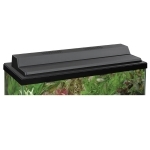 Helps provide natural day/night cycle for your fish, plants, or live coral. Programmable Timer & Power Strip in One! 24-hour programmable lighting timer. Provides a natural day/night cycle for your fish. Algone is a filter supplement used to solve and prevent common aquarium problems. A 100% clear silicone rubber sealant for repairing leaky aquariums, or broken ornaments. PurpleUp™ - uses a unique dual method approach to coralline algae acceleration. Recognized worldwide for their purity and precision. Our substrates are purposely engineered and free of impurities such as ash, metals, pesticides, and silica; which allows you to create a safe and beautiful environment for your fish and invertebrates. Arag-Alive!™ makes it easy to set up an aquarium. Arag-Alive!™ makes it easy to set up an aquarium. It’s ready to work, clears quickly, and contains millions of live bacteria to cycle super fast and create a natural biological balance. Arag-Alive!™ suppresses the dreaded “new tank syndrome”, compresses the ammonia cycle, and discourages nuisance algae. In fact, independent labs prove Arag-Alive!™ cycles days faster than other brands of live sand. That’s what makes Arag-Alive!™ the choice of new aquarists and maintenance companies where speed of set up, beauty, and reliability are demanded. alpha™ is a concentrated conditioner for saltwater. It is 50% more active than Prime® and 375% more active than the next closest competitor. alpha™ removes chlorine, chloramine and ammonia. The first product of its kind, balance™ ends the see-saw effect. It resets the buffer ratio by converting bicarbonate into carbonate in order to reassert a higher pH without affecting calcium level.